The forest has an interesting history. 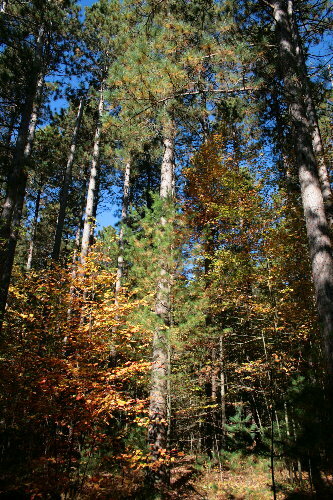 Most of it originally started out as a plantation forest, and its history as such can still be seen among the tall, straight pines that grow more or less in lines. Enough time has passed that it’s just starting to lose its plantation feel – a few pines have come down out of the rows, and the understory has been growing up, disguising the straight lines. The plantation was the result of the dedication of Ferdinand Larose, who was hired by the Ontario Department of Agriculture to address the barren sand plains that had been left over as a result of aggressive logging in the latter half of the 1800s. Virtually all of the virgin trees were eventually removed, leaving nothing but an empty desert. Agricultural practices took over, but the denuded landscape was suffering from heavy erosion. 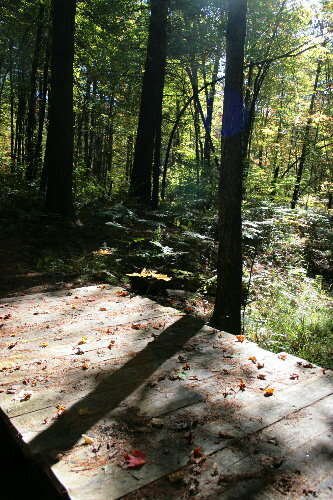 The Larose Forest began as an initiative to try to curb some of this erosion. 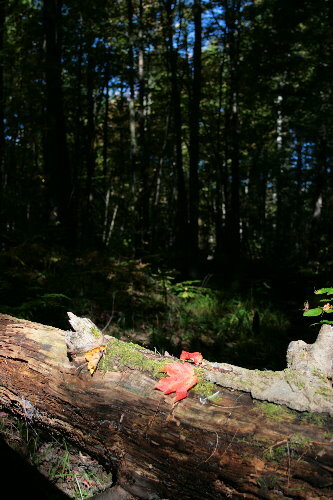 It is now identified as the second-largest plantation forest in southern Ontario (I’m not sure what is the first, and the websites didn’t say), and the largest tract of forest in eastern Ontario. The land was bought by the county from private landowners and manually replanted. 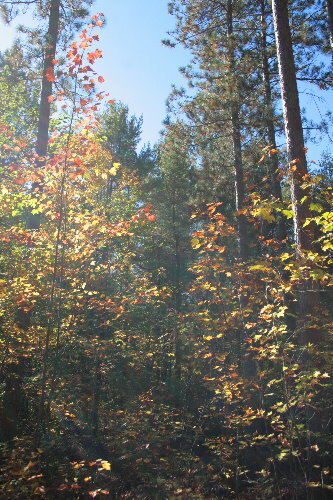 Red Pine was the first species to be planted, followed by White Pine and White Spruce, and later early-successional deciduous species such as birch or poplar. At the peak of replanting efforts, in the 1940s and 1950s, some one million trees a year were being planted. The last significant planting took place in the 1970s; annual seedling numbers had been reduced to about 200,000 by that point. 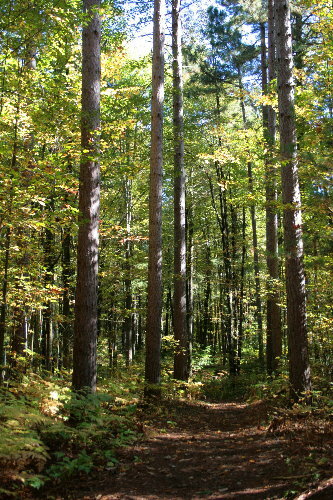 From the outset the forest was intended to be a harvested resource, but also a multi-use public land. Logging still takes place at low, sustainable rates, and until recently most removal of felled timber was done by horses. Revenue obtained through the logging is returned to the forest for maintenance of infrastructure such as roads and signage. 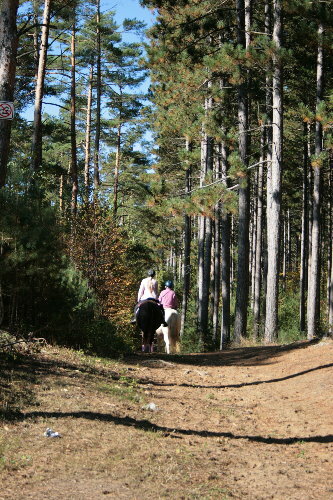 The trail system is used by hikers and mountain bikers, but also horseback riders and dog sledders. ATV riders have their own designated trails. Unfortunately, hunting also takes place in the forest – I say “unfortunately” not out of concern for the animals, though it is unfortunate for those that get taken, but rather for non-hunters who are at risk during these periods (even though hunters are supposed to avoid the hiking trails). I try to avoid anywhere there might be hunters during the open season. Although the oldest parts are only 80 years old, the forest already contains a remarkable diversity of creatures. Much of their species lists come from a BioBlitz undertaken in 2007. Other lists are maintained and added to annually. A total of 141 species of birds have been tallied from the forest, including such rare or threatened species as Evening Grosbeak, Northern Goshawk, and Whip-poor-will. Other groups, including herpetiles, mammals, butterflies, odonates, vascular plants, and others, have also been documented. They’ve even got a moth list, which stands at 211 species, probably representing only a handful of nights of effort, given that any mothing parties would by necessity need to be brought in and run off of a generator. There appears to be some development pressure on the forest, as there always seems to be with large tracts of “unused” land. Everybody seems to have an idea on the best way to utilize the space, and a lot of these people’s plans don’t include nature appreciation as part of it. So far, however, development remains as pressure and not as present activities – and hopefully it stays that way. Hunting is definitely a concern this season. A few local places that allow hunting (mainly to keep the deer population in check) only allow it in the afternoon and evening, so that other users have a chance to use the tracts in the morning. That seems to work out well. I like that idea of temporal rather than spatial separation. I think that would work better for me, too, in terms of feeling safer on the trails. Believe it or not, the final paragraph summarizes why I wholeheartedly support the notion of protected land. Well, in theory the Larose Forest is supposed to be protected land, but it hasn’t been formally designated so as a provincial park or conservation area might be. It’s kind of sad that some people look at such beautiful places and can only appreciate it for its financial potential and not for its inherent beauty. I enjoyed reading about the forest. I hadn’t gotten around to looking up inof myself. Regarding development, the forest is far enough from Ottawa that there is some hope that as oil prices rise, the area will look less attractive. Bring on the $200 barrel of oil! It’s all that will save us from ourselves. The main development pressure I was reading about was a French themed carnival kind of like the Renaissance Fair back in Milton was, only this one would be on the history of the native peoples of the area. They were originally supposed to be in Limoges and had raised funding to run it there but then once they’d obtained funding they turned their sights on the Forest. I gather they’ve signed a multi-year contract to use a site down near Casselman (I think) but there’s some question about what happens once the contract comes up. I gather the whole thing had gotten taken to court by the Friends of Larose Forest, who paid their legal fees out of their own pocket and private donations. I don’t know the details of the case, but I got the impression that the ruling was to allow consideration of development proposals. I hope higher oil prices put people off, too. 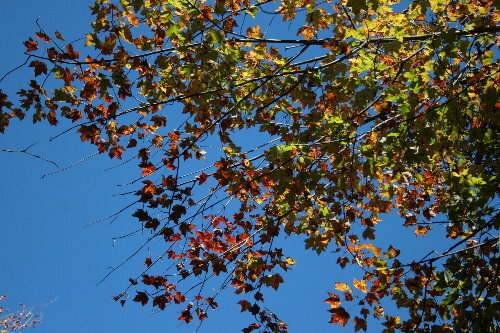 Just found your blog…and love it…all about eastern Ontario where I also live. Will make it a point to visit the Larose Forest. Thanks, Susan. I’m a recent immigrant to eastern Ontario, having grown up and lived in the GTA prior to moving out here last year, but I’m loving the region and can’t imagine moving back. The Larose Forest was beautiful and peaceful, definitely worth a visit. Kudos on the cause for the ride! That’s good stuff. I’m always watchful for those preserves, refuges and parks where hunting is allowed. At least we generally know when that’s happening, though that doesn’t make using the areas any easier during those times. Yeah, it’s unfortunate that the two activities, hiking and hunting, don’t really work well together. It wasn’t advertised in the area I was in, so I wonder if maybe all the hunting is done in other designated areas of the forest. This is a neat post, I love learning about the natural history of an area. It is so often overlooked, esp when new people move to an area and assume that what they are seeing is the “baseline” for that particular environment. I grew up in Florida, which has seen unbelievable development in the past 75 years. Many people that move there are unaware of what the state’s forests, prairies, bogs and beaches looked like pre-massive settlement patterns. Thanks for taking the time to document a forest near you. I recall reading a bit about Florida’s development in a book I read recently – possibly Return to Wild America. It’s amazing how different and modified/unnatural much of the landscape there now is, we tend to just take our surroundings for granted. It has the misfortune of not only being a good place to live, but also a good place to vacation in the winter, dual pressure. I’ve traveled all about the continent but strangely never made it to Florida; one of these days, I’d really like to visit the Everglades. 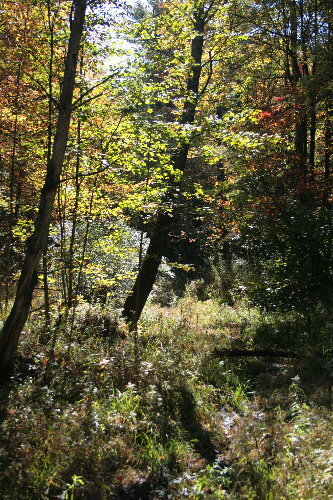 Nice pictures of the forest. I invite you to visit the ski and snowshoe trails over the course of the several weeks. The Forest takes on a whole new personality in the winter. Thanks, Louis. It’s amazing how different places can be in the different seasons, eh? Perhaps next time I’m out that way to visit my family I’ll try to stop at the forest for a bit of hiking.